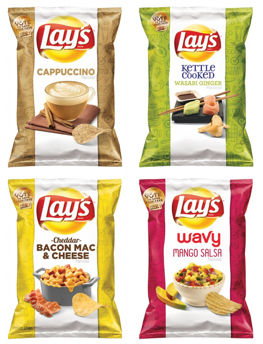 Lay’s takes it to the streets with their crowd sourced “Do Us A Flavor” contest. Cappuccino, Mango Salsa or Wasabi Ginger.. And, I have a daring palette. I gotta say that Lay’s is pretty smart. After all, they did get 7,019,658 Facebook likes. The contest drew 3.8 million consumer-generated flavor submissions in 2013, which was followed by a hugely successful online voting contest that drew more than 1 million votes via Facebook and Twitter for the new chip. (Cheesy Garlic Bread beat out Chicken & Waffles and Sriracha in 2013. But wait there’s more marketing brilliance. Lay’s had couriers ride around on bikes to distribute 200 available bags of the new flavors through a partnership with Uber. The first phase of the promotion is over, but if you want your horrendous chips delivered to you, your city could be next on their list. I’ll be sticking to plain chips and occasionally splurging for a can of Pringles. Others are with me. One reviewer described the Wavy Mango Salsa as: “the bastardization of the potato for the sake of a social media contest and the limits of even the most advanced forms of flavor alchemy.” I couldn’t have summed up “Do Us A Flavor” better myself. And now I am wicked thirsty.